Car title loans offer an option for quick approval on a short-term loan, but they’re generally very costly. To get an auto title loan, you need to pledge your vehicle as collateral by handing over the title to the lender until the loan is completely repaid. If you have no other options—for example, you need funds right away for emergency medical treatment—a title loan could make sense. But in most cases, these loans are more expensive than they’re worth, and you risk losing your car when you use one. To borrow against your vehicle, you need to have enough equity in your car to fund a loan. In many cases, you need to have paid off any other loans used to purchase the vehicle, but some lenders allow you to borrow if you’re still paying off a standard auto purchase loan. On average, these loans can range from $100 to $5,500. The amount you can borrow is based on the value of your car or the equity you have in the vehicle. The greater the value, the more cash you can receive. But don’t expect to squeeze the car's full value out of a title loan. 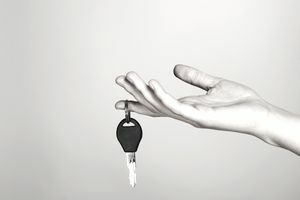 Lenders want to make it easy on themselves to get their money back, so they lend only what they can quickly and easily receive if they have to repossess and sell the vehicle. Most lenders offer loans for between 25 and 50 percent of your car's value. They may also install a GPS tracking device on your vehicle to prevent anybody from hiding the car instead of paying off the loan. Storefront loans: This article primarily discusses auto title loans from storefront finance companies. But you can also borrow against your vehicle through credit unions and banks, and you may get a better deal by doing so. Those loans might have longer payoff periods (four to five years) and different fees. Title loans are short-term loans, often due within 15 to 30 days. That means you have to quickly come up with the funds for complete repayment, known as a balloon payment, and that’s rarely as easy as you’d hope. In some cases, you can extend repayment by “rolling over” the loan. Rolling over: Instead of paying the loan off, you can get a brand new 30-day loan. However, rolling over becomes an extremely expensive way to borrow—you have to pay new loan fees every time you do it. State laws sometimes limit whether rolling over is an option. Interest rates: You may see that your lender charges 25 percent interest for one month, which may not sound that bad. However, if you were to carry that loan for a full year, the annual percentage rate (APR) of interest actually equates to about 300 percent. Total costs to borrow: Costs are high with title loans. Lenders generally charge higher interest rates than you’d pay on credit cards. State laws often limit interest rates, but those limits are still quite high. What’s more, you typically pay fees to get a title loan, and those fees increase your cost of borrowing. Even if the fee isn’t called “interest,” you’re still paying it because the includes it in the balance of your loan. Like payday loans, title loans can lead to you repaying several times what you borrow, adding up to a significant cost to fund your needs. One of the biggest problems with title loans is the risk of losing your car. If you’re unable to keep up with payments, the lender can take possession of the car, sell it, and keep its share of the money. In many cases, lenders keep the total amount of sales proceeds—because that’s what the car sells for. If your car is repossessed, things can go downhill quickly. You might not be able to get to work and continue earning an income. Alternatively, getting to work and back will take substantially longer. This impacts your quality of life, as it will be difficult for you and your family to complete daily tasks such as shopping and getting to school. If you don’t have to put your car on the line, don’t do it. Explore the alternatives before you get a title loan. The options below might not be appealing, but they might be better than that getting cash for your title. A personal loan may be your best option if you must borrow. You don’t need to pledge collateral, and you may get a lower rate. Ask your bank or a credit union about borrowing with a longer-term loan. Credit cards are rarely a smart way to borrow, but they are unsecured loans that don’t carry the risk of repossession. Extra income might also get you through a rough spot. If you can take on another job, even temporarily, you will most likely come out ahead. The extra work might not be not pleasant, and it might not even be possible, but it’s worth evaluating. Cutting costs is easier said than done, but if temporary sacrifices can get you over a rough patch unscathed, that’s probably a better option. Downgrade your car if you have a more expensive car than you need. You might be able to drum up cash by selling that car, buying something less expensive, and keeping the difference. If you must use a title loan for cash, plan for how you'll pay it back before taking the loan so that you leave nothing to chance. Eliminating that debt should become your primary financial goal.